When cracking the eggs, discard about 50% of the egg white – a whole egg will be too much and will overflow from the holes. Co-ordination is everything with this simple dish, so ensure any accompaniments are cooked and ready to serve before you begin. 1 Cut bread into 6 slices about 1.5cm thick. Butter bread on both sides, then use a small cutter to cut out circles from the centre of each slice. 2 Preheat a barbecue hot plate (griddle) on medium heat. Crack the eggs one by one into a small ramekin, then transfer them carefully to a jug, taking care not to break the yolks. Put bread slices and small bread circles on the hot plate and cook until golden. 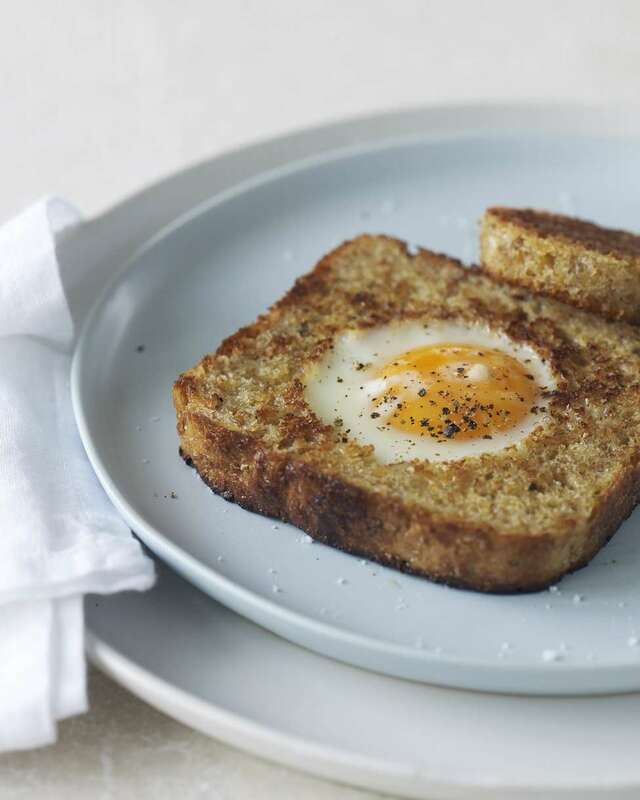 Flip bread slices over and carefully pour one egg into each cavity; use just enough egg white to fill the holes without overflowing them, and discard the rest. 3 Cook eggs until done to your liking – it will take just a few minutes for set egg whites and runny yolks. Alternatively, heat a large non-stick frying pan over medium heat. Add as many slices of bread and bread circles as will fit in the pan and cook until golden. Flip them over and fill with egg as described. Season with salt and pepper and serve immediately with accompaniments of your choice. Whoa! What a Mamma of a brunch: salt, crunch, carbs, smoke, mouth-feel and tang: Hot-smoked salmon, sorrel, poached eggs & pancetta socks it to them! I can never work out whether celebrating the last day of the year is more fun than celebrating the first day of a new year – it generally depends on what ungodly hour my head hits the pillow after seeing in the new year. But once I’m up and pottering, tea and toast won’t cut it – I’m after the full monty combo of carbs, fat, salt and chilli. It’s the best way to clear the cobwebs I reckon.